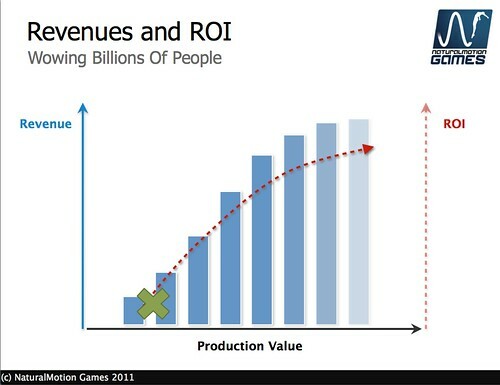 Where is mobile gaming going? With Storm8 rumored to be raising $300M at a $1B+ valuation, there’s clearly some big bets being made in the future of this space. Although I don’t always agree with them, I think the VCs are right in this case. Despite the market froth, I believe that mobile gaming (smartphone and tablet) is about to enter its most profitable phase yet. If you talk to anyone from the console games industry (either on the publisher or retailer side), they’ll tell you that Playstation 2 was the most profitable platform in the console timeline. It represented a major shift in graphics technology and generated greater results for everyone in the value chain. This is also what we’re seeing right now on mobile with high quality games like Epic’s Infinity Blade and NaturalMotion’s Backbreaker titles. According to figures released by Epic, Infinity Blade cost about $2M to develop and yielded over $11M in revenue. 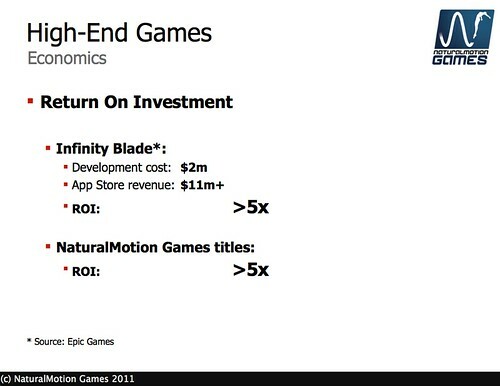 The same ratios are true for NaturalMotion Games (see slide below), according to Torsten Reil, their CEO (whose Casual Connect slides I’m using in this post). You forgot one thing in your analysis: the consumer. Is the consumer of a mobile device in the same mindset as the consumer of a Playstation 2? Is the game play environment the same? Are the user demographics the same? Do they buy products in the same way? What are the characteristics of the purchase channels they use? If you think we’ve seen the end of the “Rovios” then I think you’re going to be sorely disappointed. Next post: If you were starting a company today, what would it be?